About The BW version of the previous upload. I would appreciate if you tell me which one you prefer, or even if neither! I like this image a lot, it's Definitely an interesting image, well composed shot. excellant ..Is it a single bracket shot or multiple bracket shot compiled in single image? simply fabulous, and goes into my favs !! You've got a very good eye! but i guess that lens helps a lot too! ich finde diese Sw foto sehr fein. Hi Mary, this was taken in Canada, Ontario, Hamilton beach, more specifically you'll find it if you take the QEW highway west from Toronto and exit on East Port. Remembering Ansel Adams, classic touch! CAN I ASK YOU STH?WHERE DID YOU TOOK THE PIC?ITS A GREAT PLACE! I honestly dont know what to say abt you photo..its so beautiful..i love beaches and the B&W version...its great! so recongrats.. marvellous just a EC well deserved it! Very strong capture with excellent depth and tones ! Wow .. Thanks Hugo very much for the very valuable comment! Yes I understand what you mean and I agree that digital BW in most cases can be an easy way to artistic images, but still I think there are some images that are really meant to be BW and if done right (even digitally) can be masterpieces (example on the top of my head: http://www.usefilm.com/image/627461.html which I can't visualize in color). What do you think? Thanks once again Hugo, I really appreciate it! I really like this. Going in my favourites. More like this Fadel. As i mentioned in the colour one .. i like it in colour even though it's great in b&w. Both are very nice... this one stands out for me though. Great contrasts in this image and strong composition. Both are great Fadel but I like the colored version more. Right - like ANYONE would like neither! Fadel, you are funny. I love them both and refuse to pick. :) The both have their amazing qualities and making me chose which is better is like asking me which child is better....they are both equally amazing - in their own ways. Have a lovely and happy 2005! 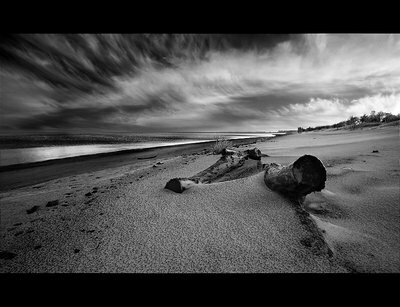 b/w version gives the oppurtunity to better appreciate details like clouds, sand and wood. In my opinion, a very good example of nature's strength. This looks fantastic !! that sky is so dramatic !! B&W version looks the best to me !! well done fadel .. mark . nice B&W fadel but Ilike the color one !! Hi Fadel, In comparison to the previous one, I don't think the B&W conversion adds anything to the photo. Even stronger, the tones in the previous one assist in building the atmosphere. The B&W conversion in this image might be considered as a somewhat forced effort to create an artistic image; I'm not implying it is, but it happens quite often, if you see what I mean. B&W serves a purpose in photography, and can be awesome, but with digital post processing, it's too easy to achieve, and is in general considered to be beautiful. The colour version already has everything it needs, and is by itself awesome. In that respect the change to B&W eludes me. Not a difficult choice for me; I chose the colour version. Naturally, that's a subjective issue. Hope you don't take this the wrong way, I'm just expressing my opinion, and it's not a cruisade against B&W images, nor against anything else. Love it. Excellent in black and white and such a super low perspective. It is very difficult to decide wich one is better. For my taste this in B&W tones. In any case good composition and mood. Fantastic the clouds effect. Best regards. This is vintage you! It is fabulous in BW, and my preference. The blue tones in the other distracted me from the strong composition, which registers more complete in the BW. Fantastic image, Fadel. This is a great composition. It is difficult to choose between this and the color version. I think I like the B/W version better. The tonal range, the texture of the sand, the dark sky, the clouds - all evoke a more powerful mood in this version. it's a very dramatic scene and I like it very much. Definitely perefer the B&W version. Was a polarizer used here? Great tonality, strong composition...you could sell this as a fine art image. Very dramatic, love the angle! I love this in black and white, by not being distracted by the colors I can soak up the wonderful tonality. Excellent use of extreme wide angle. You have some very nice work Fadel, a natural feel. I love the colorful one better .. I think I like this one best, by a small margin, Fadel! Just because the image seems to lend itself to b/w. Thanks for your comments, too!